Most games of the RPG variety have a number of races from which a player may choose when designing their characters. Orcs, humans, elves – the typical. Although on the surface, these appear to be shallow choices made in the interest only of appearance (green skin!) or some racial buff (+10 to mining, oh yeah), the differences in which race is approached across the genre betrays some important distinctions in the ways we view race and diversity. Today I want to focus on RIFT, partly because I have been playing it a great deal recently, but also because this week marks the next content patch, the first that adds new territory to the world and with that territory comes racial development for one group of game characters: the Kelari (an island-dwelling kind of dark elves). Up to this point of the release of 1.6, the Kelari have had no homeland of their own. Theirs, like mostly everyone else’s (at least on the Defiant side), was destroyed long ago and they were displaced to the mainland as refugees. This means there is no iconic Kelari architectural style visible currently. There are no Kelari landmarks, no prevalent Kelari heroes, and very little culture that is obviously Kelari. What does it mean to be Kelari? Players recently complained of this lack in difference that is not only part of the Kelari life, but of all the RIFT races. For example, the Eth (human) civilization was destroyed also ages ago and although there are some ruins popping up in the desert, but they form no cohesive unit. They are random pieces of road (all identical pieces) not in any order, not forming any recognizable pathway but simple pieces of rubbish littering the sand. In contrast, I think of the High Elf ruins all over Kalimdor in Azeroth (World of Warcraft). I could recognize High Elven ruins if I saw them in real life and I would know it wasn’t Dire Maul or it wasn’t Azshara and I could tell it wasn’t Night Elven ruins. The architecture is not only obviously different – it is cohesive and the ruins themselves form different identifiable places. 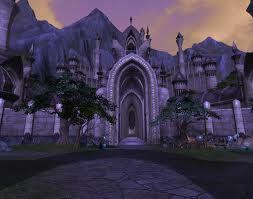 Further, Night Elven towns and houses are visually consistent and different from Human towns or Dwarven towns. Each has their own architectural style that sets them apart and bestows racial ownership on the environments around them. In RIFT, although the two factions, Guardian and Defiant, have clearly different ideological views and are visually different races up close, they are otherwise somewhat indistinguishable. From afar, body models are very similar and clothing across races and factions is not stylized separately. The world itself is not exactly homogenous – there are different environments, all lovely in their way – but there are no recognizable cultural regions. Even those lands which are cultural bases (like Stillmoor for Mathosians) lose their racial significance because they are all overtaken by death in the aftermath of Regulos. 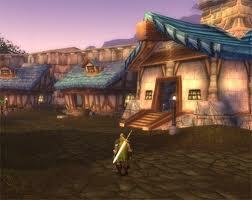 There is no town for Mathosian players, one visually distinguishable from a Kelari town or a Dwarven town. The one main Defiant city is more a kind of strategic headquarters. There are no taverns, no houses, and no shops. Not only does it not provide an iconic living space for any of the races, it is only slightly Defiant. The Defiants are known for their use and love of technology. Their horses are mechanical and scattered throughout the city are machines and power sources. However, these feel like mere decorations, not the actual make-up of the place. Shouldn’t a Defiant city be more iconically Defiant? Why are there not lights of sourcestone, mechanical breweries, gears lining the walls, electric currents lighting all the pathways? What is particularly Defiant about the place at all? What is Defiant is the ideology, but without visual differentiation, it is hard to separate that ideology from that of the Guardians. The Guardians are reliant on faith in the Vigil, somewhat fanatically. Yet when you see Defiants and Guardians in the field, they blend together as one. Clothing styles are all the same. Body models are similar (aside from the short Dwarves who only stand out due to height). The only real difference is the coloring of their name if you are engaged in player versus player combat, an element only of the interface, not of the gameworld itself. Players have asked not only for more visual differentiation between the factions but also between the races. While some players are fine feeling like part of one large group, others want the individuality of race afforded by unique architectural styles and culture. It is not enough to simply have a different name, to know that one is Eth. They want to see it. How you can tell you’re different if you all look the same? Even ideology is hard to separate in a mass of look-alikes. Which ones put faith in gods and which in machines? When you can’t tell the difference, is there a difference? Without the visual signifier of an Other, players feel homogenous even when their faction’s ideologies differ. Is this merely a factor of the game being a largely visual exercise? Or does this say something about how we understand race and diversity? We value difference in our culture today, but those differences are largely visual. Even when those who look different share the same culture, we struggle with an understanding of sameness. When players ask to look more different from others, when they request the ability essentially to define themselves against an Other, are they betraying a view of race and difference that we share in real life? RIFT doesn’t answer these questions but I think it does prompt us to ask ourselves how much visuality plays a part in our understanding of ourselves and those around us. We are surely used to understanding many people visually. We struggle to combat the assumptions our initial visual experience with an individual prompts. In games though, it is unproblematic to do so. One can assume a Night Elf likes moonlight because, well, they all do. Cultures and races are typically clearly defined and there are no marginal or transgressive types. 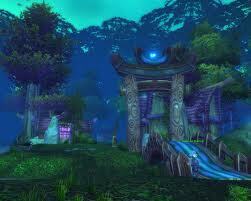 Night Elves are Night Elves are Night Elves. It is a place where defining Self visually from an Other is a perfectly fine thing to do. It is a place where war based on ideologies is commonplace and even encouraged. In fact, it is a place where visuality to help distinguish and confirm those ideologies is demanded. It is a place oddly familiar and yet somewhat opposite from everyday life and somehow in this way it is more comfortable. 1) Personal physical attributes: you’re right, we’re accustomed from RL to think of “race” in terms of personal physical features, and that carries over into game space – however, that’s occluded somewhat by the game convention of using the word “race” to mean “species,” which is very strange, and deserving of a good paper. 2) Cultural artifacts, or style: This *may* be more particular to games than to RL. In games, we expect culture to be indicated by visual triggers: dwarven metal-working, orcish spikes, delicate and fluid Elvish buildings and artifacts. Since we don’t have other tokens of culture, typically – salsa music, depressing Russian novels, Noh theater – the visual in games carries extra duty here. 3) Logical technology: This builds on, but is distinct from, (2). We know desert cultures don’t have wood, so their architecture should focus on stone. When it doesn’t, there needs to be an explanation. The perfect example of this is the wooden gates of Orgrimmar: we know it comes from the contested Warsong Logging Camp in Ashenvale! Similarly, the Blood Elves use magic as a power source, so we don’t see mechanical/muscle power in use in Silvermoon. Logical inconsistencies catch our eye even if we’re not thinking through the issue, while these consistencies go a long way to making a synthetic culture feel real to us.